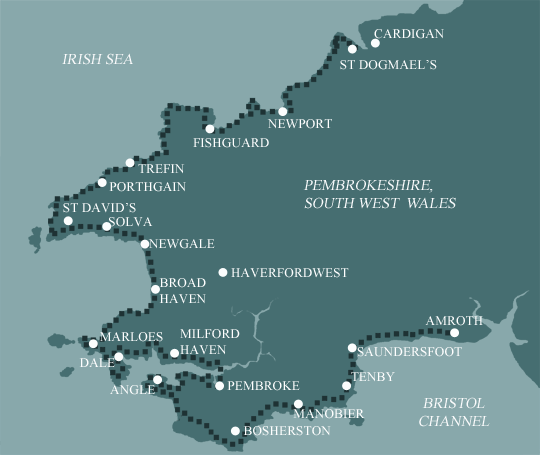 This is the second shortest of our full length Pembrokeshire Coast Path holidays, walking the whole route in 14 days. This holiday splits the long start to ease you into the route and stops at the pretty seaside town of Tenby which is well worth a visit. However, average distances are high with the longest day is 16 miles, so you need to be fit. Solva is probably the prettiest village on the path. The lower village is a line of painted houses tucked below the steep hillside that leads to the little harbour. The claustrophobic nature of this part is due to its situation. It sits on an old glacial melt water channel formed some 10,000 years ago at the end of the last ice age.